These are 1/32 plastic based scale replicas of Superstox or Brisca Formula 2 Stock Cars. 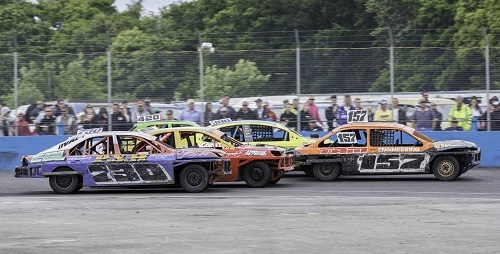 Superstox can be seen racing regularly at the local Foxhall Stadium - the Clubs original home - on the outskirts of Ipswich promoted by Spedeworth International. 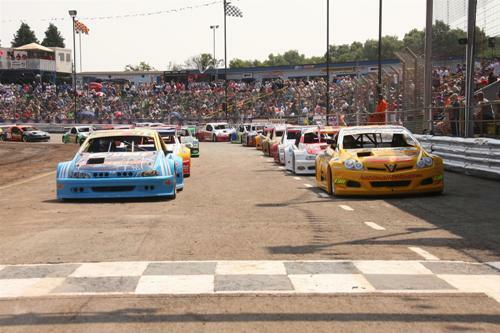 The Slotstox formula is the Foxhall Foxes Slotstox Clubs oldest formula. In fact it was this formula that the club was founded on in 1984 (following successful introductions at clubs in Aldershot and Wisbech). All of the cars are hand made to a set of rules that has been evolving over almost 30 years although the very essence of the class remains. The Foxhall Foxes Slotstox Club is affiliated to the National Slotstox Association meaning that the club has the same construction rules as the Wisbech Fen Tigers Slotstox Club and the Arena (Cheshunt) Slotstox Club. This is the main class of the Foxhall Foxes Slotstox Club running at 60% of our meetings. 'Open' championship meetings are also held between clubs throughout the year with the main event being the prestigious World Championship establised by the Aldershot Knights Slotstox Club in 1983. Slotstox is about racing that is fast, close and contact orientated just to keep things interesting! Whilst contact is allowed this is not Banger racing of any sort and a reasonable level of skill needs to be developed for matching up with the best drivers who usually remove anyone they can not get past. As with all of our classes you are encouraged to build your own car but there is always someone to help or do it for you. 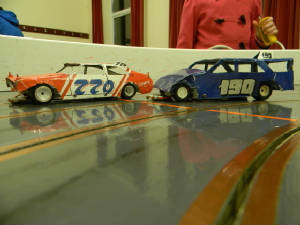 These are 1/24 plastic based scale replicas of the 2 Litre Saloon Stock Cars. 2 Litre Saloon Stock Cars are a National based formula which can be seen racing at the local Foxhall Stadium - the Clubs original home - on the outskirts of Ipswich promoted by Spedeworth International. Most of the cars are built by using a body shell from a model kit, then fitting it with a ladder style chassis and don't forget the bigger bumpers for maximum contact! Slot-Saloons are about lots of heavy contact where pushing as many opponents off the track before going on to win is the preferred style. These are raced roughly once a month. For something a bit different we also ocassionally race Slot-Saloons with a model caravan attached! As with all of our classes, our grading system penalises the faster drivers who have to start further back along the track. This not only makes them have to work harder but it also makes for close finishes and action throughout each race. 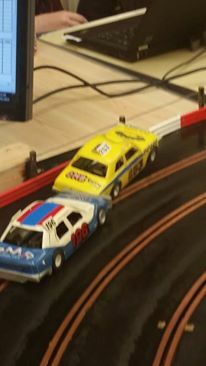 The Slot-Saloons were originally a 1/32 scale formula before converting to 1/24 scale. These 1/24 scale saloon based cars are replicas of the Bangers formula. Bangers can be seen racing regularly at the local Foxhall Stadium - the Clubs original home - on the outskirts of Ipswich promoted by Spedeworth International. Needless to say, as the name suggests, this formula is all about crashing but not only is contact allowed...it is actively encouraged! Whilst for some the aim is racing to win, for others simply destroying the opposition is often the preferred objective! The reusable plastic chassis and replaceable bodywork means you can crash all night and have a new car for the next meeting at very little cost, just don't expect to get past the first corner. 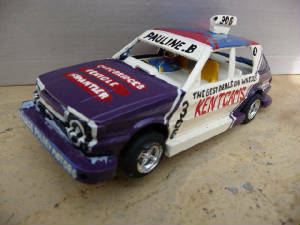 For something a bit different we also ocassionally race Van Bangers and in the past have raced an 'unlimited' class where unusual cars were often the favoured material! 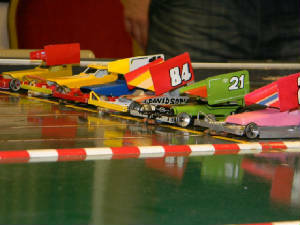 Slot Rods were a formula that the club ran in the early 1990's as 1/32 plastic based scale replicas of the National Hot Rods formula of the day. National Hot Rods of the present day can be seen racing regularly at the local Foxhall Stadium - the clubs original home - on the outskirts of Ipswich promoted by Spedeworth International. Slot Rods were a non contact formula which required extremely skilfil handling to avoid the opposition. This formula is only on the odd ocassion as more of a fun event. 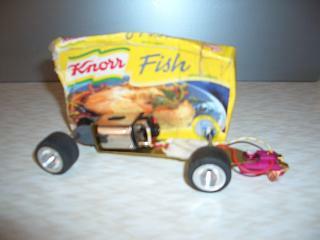 As the name suggests, the cars are made from household rubbish....basically anything to which you can attach axles and in or around which you can fit an engine! Toothpaste boxes are a favourite but toilet roll tubes and camera film boxes have also appeared in the past! The club has four styles of track at its disposal. 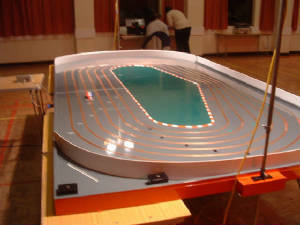 A three piece five lane track with two inter-changeable centre sections plus two six lane tracks. 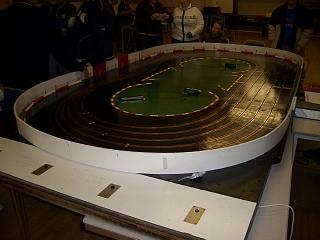 All the tracks are scale ovals built from wood with chicanes to allow full contact and de-slotting of opponents cars. The bends for this track are the same as with the five lane track (bendy chicane) but the straight chicane centre section is slightly longer. With the straight through chicane centre section in place, this is probably the largest track at any club where you will find plastic Slotstox oval racing. Its main feature is that one side has a straight chicane running the whole length where a car in any lane is able to hit cars in at least two other lanes (cars in lane three can hit all other cars on the track!). This track is all about speed and often favours the drivers in the inside lanes whilst those on the outside need to be extremely quick or patient and make the most of others crashes. Both centre sections and the bends have around the outside a plastic barrier in front of a post and wire fence to give it that real oval race track look. The bends are the same as used for the five lane track (bendy chicane) - a track built in 1991. The straight through centre section was built over the course of the 1997/1998 winter close season together with the addition of the post and wire fence to the entire five lane track. It was previously a figure of eight centre section used only by Bangers before being altered due to damage caused partly by the racing and partly when taking it apart after each meeting. The first meeting at which racing took place on the 'new' centre section was the 1998 Bangers Foxhall Championship. Substantial renovation was carried out during the 2002/2003 close season and most of the 2003 season. The track was fully relaid and the plastic barriers added in front of the post and wire fence. The bends for this track are the same as with the five lane track 'straight chicane'' track but the bendy chicane centre section is slightly shorter. The chicane which runs along one side of this track requires considerable driver skill to get round quickly or to contact another car but is also designed to reduce the advantage of the inside lanes. The chicane includes a flat U shape with the U being flatter for each lane going outwards with lane 5 being virtually straight. Whilst drivers on the inside are slowing up to negotiate the bends, those on the outside can keep the power down! Both centre sections and the bends have around the outside a plastic barrier in front of a post and wire fence to give it that real oval race track look. The five lane track (bendy chicane) was built in 1991. Prior to this track being built, racing at the Foxhall Foxes Slotstox Club had only been on four lane tracks. This track is built for speed and often favours the drivers in the inside lanes whilst those on the outside need to be extremely quick or patient and make the most of others crashes. The track has a minimal contact point but at high speeds when contact does occur the crashes are often spectacular! 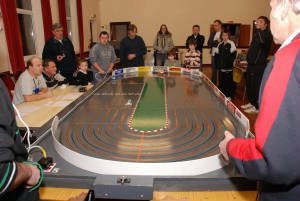 The track was built by the Great Blakenham Slotstox Club and was first used during the 2008 season. The track was known as the 'Red' track at the Great Blakenham Slotstox Club and was sponsored by Claydon Skip Hire. From the start of the 2009 season, the track has been used by the Foxhall Foxes Slotstox Club following the merger of the Foxhall Foxes Slotstox Club and Great Blakenham Slotstox Club. This track requires considerable driver skill to get round quickly or to contact another car but is also designed to reduce the advantage of the inside lanes. 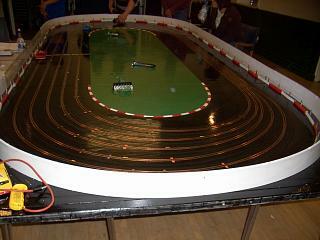 The inside lane is very tight and with a tricky chicane for the inside lanes to negotiate the track is a real leveller. The track was purpose built for the Great Blakenham Slotstox Club (previously the Claydon Slotstox Club) - a club established in 2000. The track was known as the 'Blue' track at the Great Blakenham Slotstox Club. From the start of the 2009 season, the track has been used by the Foxhall Foxes Slotstox Club following the merger of the Foxhall Foxes Slotstox Club and Great Blakenham Slotstox Club.